Lang quick compression tester is ideal on cars with easy accessibility to cylinders. Lang quick compression tester is made for domestic and imported cars and trucks with gasoline engines. Lang quick compression tester features a short offset stem with a universal rubber cone for easy seating in most spark plug holes. The 2 1/4'' gauge has a dual scale dial with ranges from 0-300 PSI and 0-21 bar. 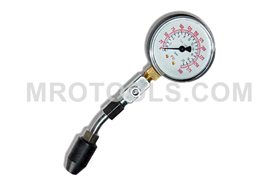 The TU-8A Lang Quick Compression Tester is one of thousands of quality tooling products available from MRO Tools. Please browse Lang Gas - Petrol Compression Testing Equipment for tools similar to the TU-8A Lang Quick Compression Tester. TU-8A Lang Quick Compression Tester description summary: Lang quick compression tester. This handy tester is ideal on cars with easy accessibility to cylinders. For domestic and imported cars and trucks with gasoline engines. Quantity discounts may be available for the TU-8A Lang Quick Compression Tester. Please contact MRO Tools for details.